All WATER monsters on the field gain 500 ATK and DEF, also all FIRE monsters on the field lose 400 ATK and DEF. If this card is destroyed by battle or card effect: You can target 1 WATER monster in your GY; add it to your hand. You can only use this effect of “Mistar Boy” once per turn. Baneful I have no other comments to add except that I’m happy that Star Boy finally got a sequel. 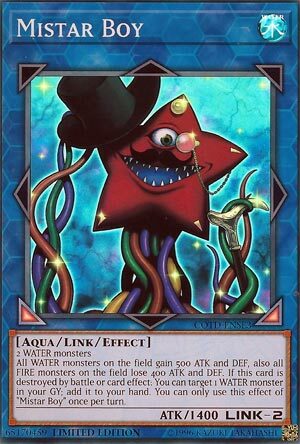 Mistar Boy is a WATER-centric Link Monster that gives all WATER decks some serious support. While not strong, it gives all WATER monsters a 500ATK/DEF boost, while dropping FIRE monsters 400ATK/DEF (mirroring the effect of its previous version: Star Boy). The ATK/DEF boost is great, any added damage is appreciated, and the 500ATK boost can make a difference when countering opponents monsters. Mistar Boy will replace itself when it leaves the field by card effect or battle (the latter likely to happen very quickly). Any WATER monster is available to Mistar Boy to add back, acting like a WATER version of Warrior Returning Alive. In WATER decks it could be a fun monster to use. Deep Sea Diva and Nimble Beaver can make this monster quickly without much investment. WATER decks can do a great job swarming without the use of their Extra Deck, but this could be a good addition in case they needed to pull something out of there. Mistar Boy is just average support for Water decks. It takes two Water monsters to Link Summon this 1400 Atk Aqua-type. The downward pointing arrows are good. The Atk and Def boost for all Water monsters is nice while the 400 Atk and Def decrease for all Fire monsters is cute and nostalgic. If Mistar Boy is destroyed you get to add a Water monster from the grave to your hand, but only once per turn. These are good effects, but not great. At the very least, it’s a good Link option for Water decks. Plus it’s a water monster that floats upon destruction. I love puns. The great thing about the preview cards in Special Editions is that one of them is usually a pretty good card, and here is the really good card we get a preview of from Circuit Break. Makes me hope the other Attribute Link Monsters are in the Special Editions in the future. But here is the latest Attribute Link Monster, Star Boy is all grown up and is now Mistar Boy. Mistar Boy is a Link-2 monster requiring two Water Monsters and points Bottom Left and Bottom Right. So far this is a must for Water decks that use the Extra Deck often, and we haven’t even previewed the effect yet. Mistar Boy boosts Water Monsters by 500 ATK and DEF while lowering Fire Monsters by 400 ATK and DEF, similar to the original Star Boy, only boosting/lowering DEF as well now. Also if Mistar Boy is destroyed, you can grab a Water Monster back. There are several good Water monsters this can grab back, especially in the Mermail/Atlantean deck, and that especially goes for Neptabyss, the Atlantean Prince. If you are playing a Water deck and the Extra Deck is useful for you, play this. This will allow Bahamut Shark into Toadally Awesome still be viable. We already got Missus Radiant, now Mistar Boy, I really wonder which Attribute is next. Mistar Boy is a decent Link Monster, being only Link 2. The Link Arrows may leave something to be desired, however. Not terribly strong at only 1400 attack, but easy enough to Summon with two generic Water Monsters. It just doesn’t do very much. All Water Monsters on the Field gain 500 attack and defense. Not just yours, ALL, so if your opponent happens to be playing Water also, you’re helping them. When destroyed, by Battle or Card Effect (always good to have versatility) you can target a Water Monster in your Graveyard, and add it to your Hand. At least you get something from it. Not bad, but it’s not a crucial piece to a Water Deck either, in my opinion.